After 103 Years, Dudley Perkins Co. Harley-Davidson in South San Francisco, California Sells with Help from George Chaconas of Performance Brokerage Services, Inc.
Harley-Davidson and new car dealership broker, George C. Chaconas of Performance Brokerage Services announces the sale of Dudley Perkins Co. Harley-Davidson in South San Francisco, California from Janet Perkins to Rich Gargano and Cliff Chester. Rich with history, Dudley Perkins Co. Harley-Davidson endured global events such as World Wars I and II, and the Great Depression. Rich with history, Dudley Perkins Co. Harley-Davidson endured global events such as World Wars I and II, and the Great Depression. During WWI, Harley-Davidson Motor Company’s entire manufacturing inventory was supplied to the United States Military, so Dudley Perkins, Sr. shifted the dealership’s focus to buying and selling used motorcycles. Years later, the motorcycle unit for the California Highway Patrol was formed and the dealership provided not only the equipment to the CHP, but the training for the riders. After WWII, Dudley Perkins Co. Harley-Davidson purchased the excess used motorcycles from the military, refurbished them and offered them for sale to their customers. In 1968, Perkins, Sr. handed over the baton to his son, Dudley Perkins, Jr. who owned and operated the dealership until 1996, when he then passed control onto his son, Thomas Perkins, the third Perkins generation. Wounded in a motorcycle accident, Tom Perkins had lost his leg, although that did not stop him from continuing to ride. Tom operated the dealership until his untimely death in 2015. Tom’s wife, Janet and their son, Christopher continued to manage the dealership in his honor and the way Tom would have run it. Janet and Chris, along with Nicole Perkins, Sgt. Eric Batchelder and Mark Sangervasi, founded the Tom Perkins Legacy Foundation, which provides support and assistance to individuals who have been affected by the loss of a limb. 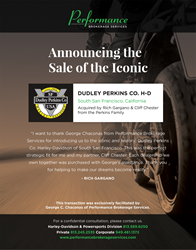 Today, Dudley Perkins Co. Harley-Davidson is a nationally renowned dealership and a significant piece of Harley-Davidson Motor Company’s history. In 1998, Dudley Perkins, Sr. was inducted into the American Motorcycle Association Hall of Fame honoring him for pioneering the sport of motorcycle racing, his success as a racer, and for lobbying the city officials and arguing on behalf of motorcycle rallies and the benefit to their communities. Performance Brokerage Services, an auto dealership broker, specializes in professional intermediary services to buyers and sellers of automotive, Harley-Davidson and Powersports dealerships.